A walk about Paris will provide lessons in history, beauty, and in the point of life. Whoever does not visit Paris regularly will never really be elegant. Our days in Paris were busy with activity. Andrea figured out how to rent the bicycles that we had seen the locals riding all over town, and we were off to explore the entire city. I am convinced that the only — and best! 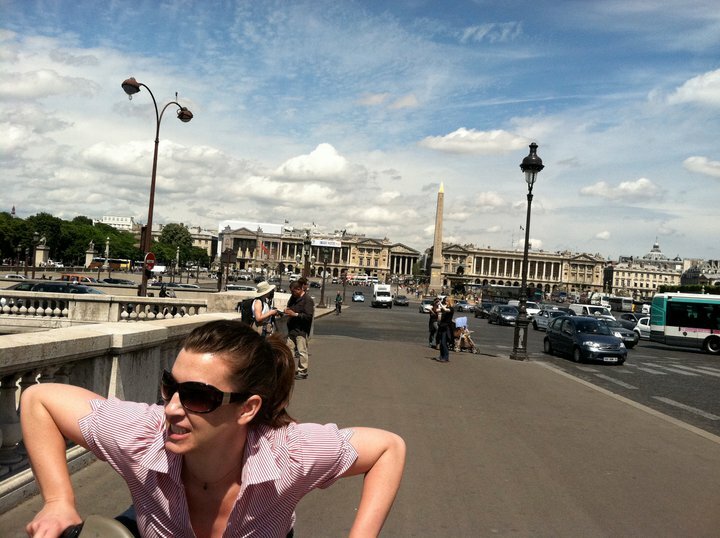 — way to see Paris is on a bicycle (with a baguette in the front basket, of course!). Best bikes in the world. 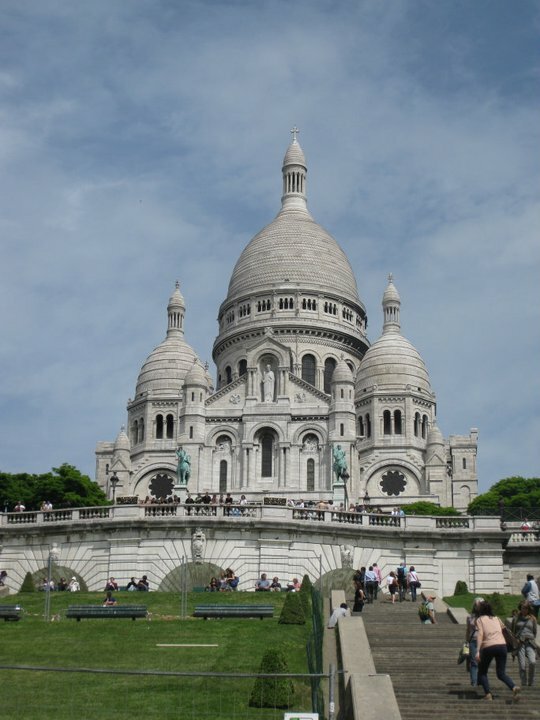 Our first mission on that gorgeous May day was to ride up to the Sacré-Coeur. We hunted for fabric in the neighboring garment district, and then lunched on goat cheese-stuffed tomatoes atop butter lettuce with a drizzling of vinegar, and a freshly baked, still-warm-from-the-oven baguette. 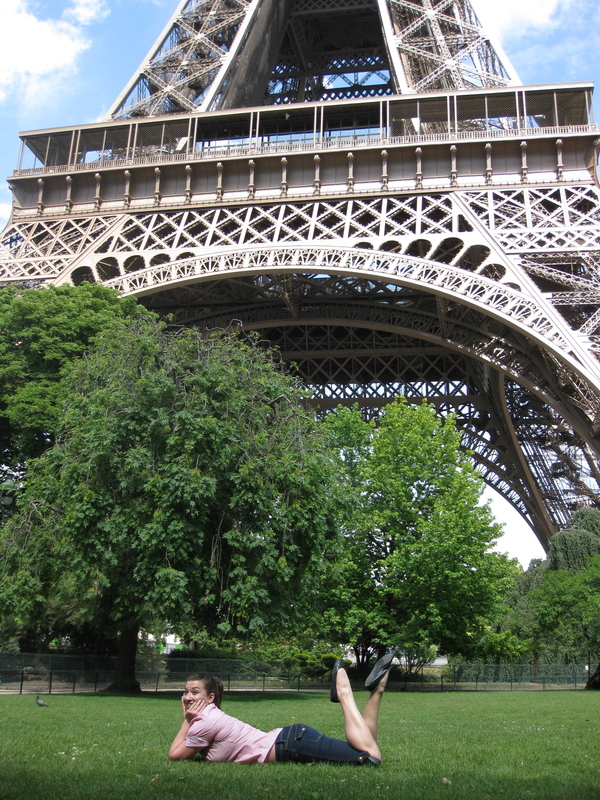 Afterwards, we biked to the Eiffel Tower, stood in line to enter the Musee de’ Orsay (but got tired of waiting) and sweated through 90 minutes of Bikram Yoga. It was my first experience with Bikram. The cramped room was cranked to 105 degrees (Fahrenheit), and almost as soon as I started breathing, sweat poured from every inch of my body, including my kneecaps. Somehow the offensive and pungent French body odor/sweat didn’t bother me, for I was distracted by the attractive, muscular instructor who sported a Speedo. He screamed at us the entire time from his platform at the front of the room. The next morning we did more yoga (who knew that a trip to Paris would turn into a yoga retreat!!?) and (illegally) rode our bicycles through the Arc de Triomphe. Cars, busses and motor scooters honked and whirled around us as we furiously pedaled (and screamed!) our way through the roundabout. It was exhilarating! We made our way up to the Bois de Boulonge, where we rested our legs a while before continuing on our newfound mission: to find the racetrack. As we rode through the park and into the thicker woods, I noticed random, scantily-clad women standing along the street. Some were creepily concealed in the trees. Others were simply men dressed as women. You just need to know these things. That evening, bodies screaming in happy exhaustion from our day’s adventure, we set out with a bottle of champagne to drink along the Seine River. As we traipsed down the worn, cobblestone steps of the Île de la Cité and towards the water’s edge, I was once again approached by a Frenchman. This one was considerably younger than the first two. He started speaking, quickly, in his beautiful language. He immediately wrapped his arm around me and gestured with his free hand as he spoke. Occasionally, he would gently touch my chin as he whispered sweet nothings into my ear. I allowed him to carry on for a while before I spoke up. “I…I don’t speak French,” I apologized. The Frenchman – who was definitely in his early 20’s – looked surprised. I stopped in my tracks for a moment and gazed at him, almost incredulously. This would be Frenchman #3. I was definitely getting what I had asked for, and then some! He clasped his hands together, and his piercing blue eyes met mine. One of his iPod ear buds hung, lazily, from his right ear. He smelled young and fresh. He was definitely attractive. He shook his hands at me. “Please, please, please, please PLEASE kiss me,” he begged. Andrea and I burst out laughing, and she covertly reached for her phone, readying it to capture the moment. I looked up at my suitor. The River Seine shimmered behind me in the glowing city light. The historic cobblestone beneath my feet seemed to propel me forward, into this young man’s arms. There was a buzz of conversation between crowds of friends and lovers gathered along the riverbank, and the gentle breeze flirted with my freshly washed hair. It was the perfect moment for even just a minute of romance. I tucked a piece of disheveled hair behind my ear, and shrugged. And so, he kissed me. Eagerly. Oh, those Frenchmen and their kisses. I finally pulled away, and Andrea and I continued to walk. The young man followed us, attempting to coax me into his arms again. “Please, please, please – more kissing!” He pleaded. I smiled, but kept walking away. He looked extremely disappointed, but finally got the hint, and darted back to his friends. Andrea and I laughed and laughed. I was having quite a successful run as the “kissing bandit” in Paris! As we made our way to a less populated area along the riverbank, I reflected upon this newfound confidence that I had developed on my journey – literally and figuratively. I couldn’t believe it, but it felt so damn good to be single, even if it were inappropriate to be kissing some random strangers on the street. I didn’t care. It felt amazing to be noticed, even by much younger men. What is more, it felt good to be free. I could just walk away, without my heart hurting; without it longing for, or being attached to, a man. I could give away sweet, innocent (enough) kisses, but I could hold onto my heart. It might sound crazy, but it was empowering. And so, our time in Paris rapidly came to a close. We ultimately decided to scrap the usual touristy things and headed (on bicycles, of course) to the horse races at Longchamp. We put money down on a Yankee horse and won! We picnicked again with Cecile in the Parc de Buttes Chaumont, and conducted a therapeutic ceremony in which I tossed an entire apple pie off the top of a monument. We dined with British actor Rupert Friend (who tried to disguise himself as “William”) at Jim Haynes’ 30-year old tradition of a Sunday dinner. I was determined to make Mr. Friend Frenchman #4. I chatted and flirted with him for about thirty minutes, but, decided that, alas, he couldn’t be my next French kiss, because he was English. Okay, okay. He wasn’t interested. We invested in the most amazing tea at Mariage Freres, attended mass at St. Germain des Prés and listened in awe to the massive pipe organ seemingly shatter the impeccable stained glass windows. We patroned the Opera Bastille and purchased tickets to see Andrea’s favorite: The Marriage of Figaro. It was my second opera, ever — the first being Offenbach’s “La Périchole” at the Sydney Opera House when I was on tour with my church choir at the age of sixteen. To my surprise during Figaro, I started to sob at the Countess’ solo in Act III, wherein she ponders the loss of her husband’s love. Andrea and I both sobbed tears of joy and empathy; tears at the overwhelming beauty of the piece; of art. Angst. Love. Marriage. Loss. And comedy. In the afternoon of that last remaining day, we again drank champagne, just on a simple park bench in the Bois de Vincennes. The bench overlooked a glistening lake that was populated with happy ducks and happy people in rowboats. In the distance stood a ferris wheel, and the air was fragrant with a mixture of blossoms, freshly-cut grass and cotton candy. This time, I definitely saw a single, red balloon floating in the breeze. 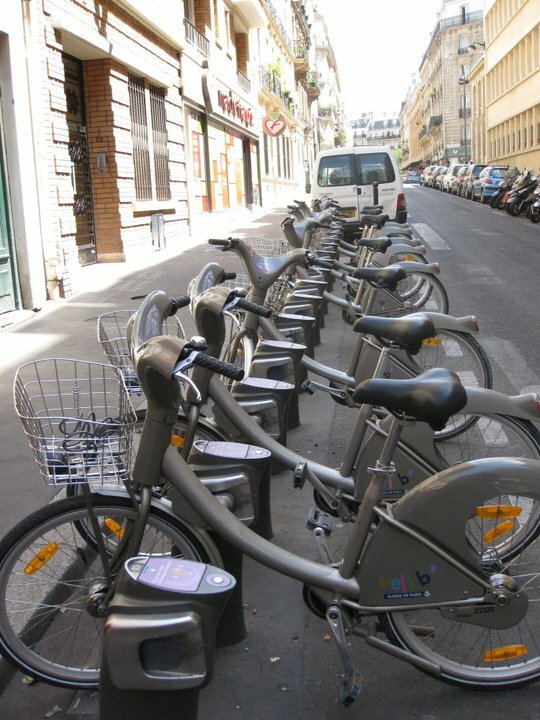 We will ride bicycles, drink champagne, and frolic throughout the most romantic city in the world, for, as Michael Simkins puts it, Paris is a place in which we can forget ourselves, reinvent, (and) expunge the dead weight of our past. Love the Paris quotes. Love reclaiming Paris for you! I have never had strangers beg to kiss me. Love that you’re willing to kiss-and-tell the world! Those are also the only two operas I have ever seen. The first, obviously, in Sydney, and The Marriage of Figaro in Vienna a couple of years ago. I remember that some of the people in our group said that it was a second-rate opera. I didn’t know the difference.